Anyone who’s tried to cram an ample lifestyle into a small apartment is familiar with the urge to rebuild hidden corners and closets into functional living space. 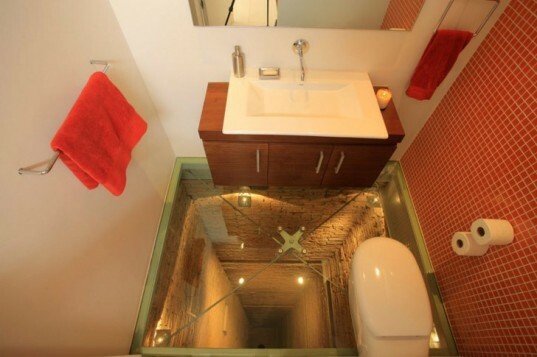 Hernandez Silva Arquitecto’s conversion of an unused elevator shaft into a powder room for the 15th floor PPDG penthouse unit in Guadalajara is a remarkably impressive use of space, although it’s definitely not for the faint of heart – the bathroom is suspended above an elevator shaft! The update of the 1970s-era colonial-style apartment by Hernandez Silva Arquitectos saw the firm create a contemporary, open plan conversion of the existing space, removing walls and installing larger windows while working around the original column and slab structure of the building. The result is a sleek, modern, minimal red and white hued space which opens out into a dramatic balcony. But the small additional bathroom is one of the most striking features of the apartment conversion. The original layout of the apartment placed two elevator shafts within the center of the unit, but only one functioning elevator system was ever installed. Rather than take a conventional route of say, installing a closet or even laying an opaque floor, the architecture firm retained the quirkiness and drama of the space’s original function. Following the palette of the rest of the apartment, simple clean lines of red and white allow the small space to remain as open as possible. And beneath ones feet? 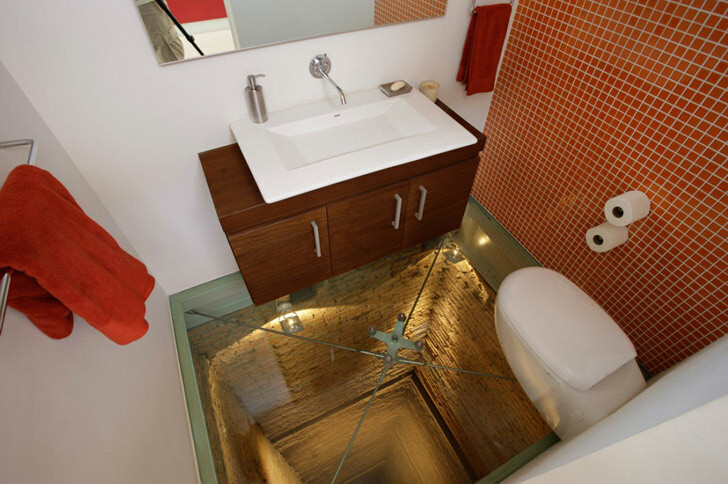 That space is particularly open; the bathroom sits atop a glass floor which provides a dizzying view fifteen floors down. The earth tone bricks reflect accents of natural wood within the room. It’s certainly not a room for those with vertigo, but it’s almost certain to be a conversation starter in an apartment wholly designed for entertaining. Anyone who's tried to cram an ample lifestyle into a small apartment is familiar with the urge to rebuild hidden corners and closets into functional living space. Hernandez Silva Arquitecto's conversion of an unused elevator shaft into a powder room for the 15th floor PPDG penthouse unit in Guadalajara is a remarkably impressive use of space, although it's definitely not for the faint of heart - the bathroom is suspended above an elevator shaft!